An all-new team of X-Men forms here! 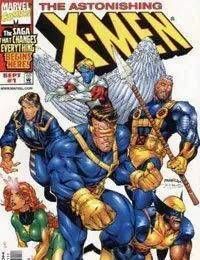 As the enigmatic Mannites are hunted down by Death, one of the mysterious horsemen of the Apocalypse, that seeks to bring about their extinction, Phoenix and Cyclops scramble to assemble a team capable of defeating this dire threat, but are unaware of the horrible price one among them will pay! Who will be the Astonishing X-Men? And will they be strong enough to survive the coming war?